Humans who are looking at us, behold man and woman equal, purely by their mutual will! Have we presumed too much in announcing a unique marvel? Leonie Rouzade, angry, combative, and prominent in the feminist cause, delivered a scathing social commentary in this pair of tales from 1872. When a shipwreck strands a man in a perfect island civilization in A Voyage to the Isle of Utopia, he, after confronting a parade of didactic lectures, accepts that the rigors of logic have rendered obsolete human individuality. 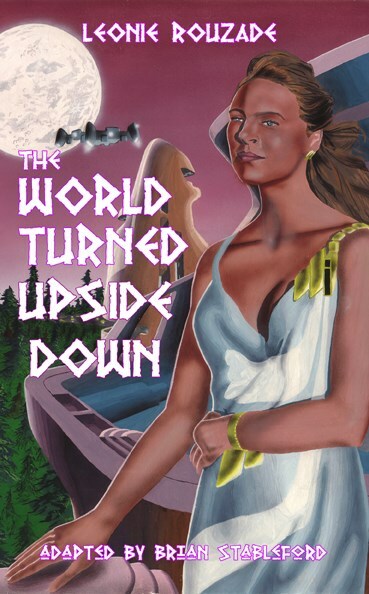 The World Turned Upside Down is the earliest fantasy of gender role reversal ever penned. An idealized woman, Celestine, climbs out of her circumscribed existence to rule a foreign kingdom, only to mandate the subjugation of men by women. Even today, its originality remains unsurpassed. It is a grandiose conte philosophique, taking satire to the edge of absurdity.